Customer Account Representative takes charge of managing and transmitting the portfolio of customers to the internal teams. 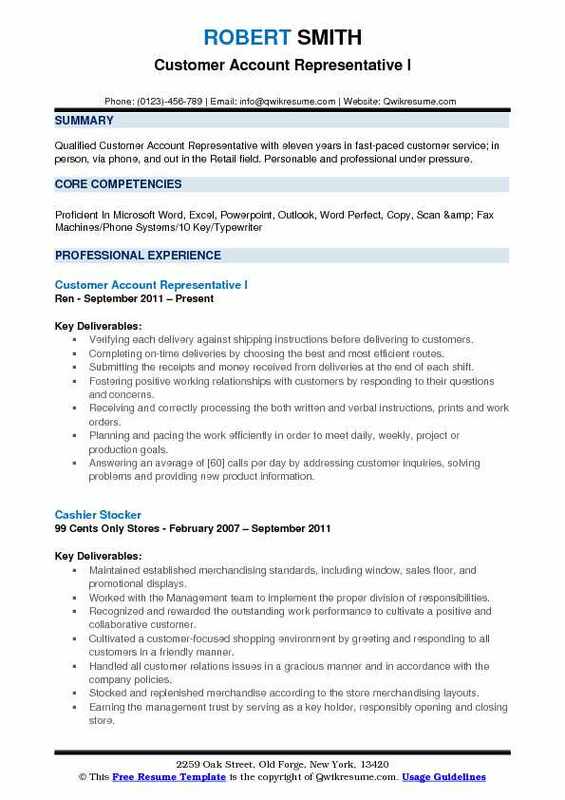 A Customer Account Representative Resume emphasizes on job duties such as addressing customer queries, up selling or cross-selling products, identifying new opportunities, negotiating contracts, handling paperwork, responding to customer queries and finding solutions, passing on information from customer to the account managers, presenting additional or new service or products to existing customers, cold calling potential customers and networking with stakeholders. 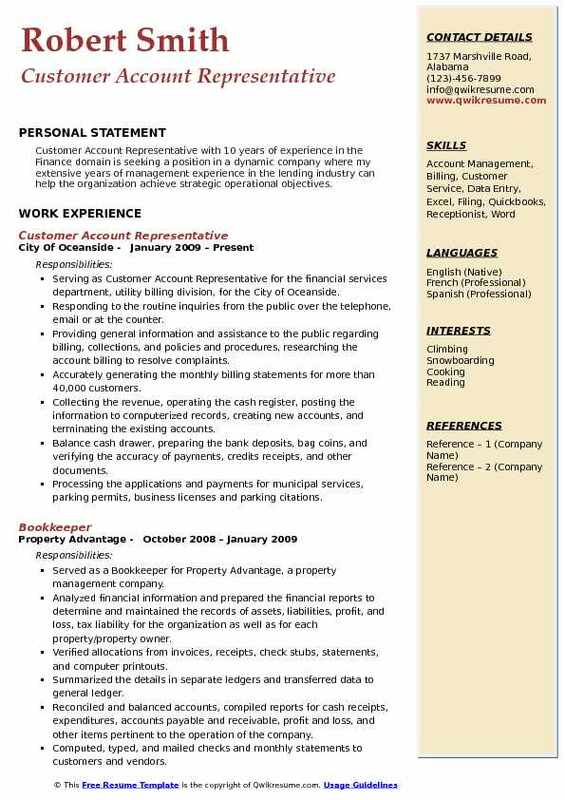 Employers pick those resumes that demonstrate customer account service expertise, proficiency in MS Office, familiarity with Sales force, negotiation skills with multitasking ability. Even though Customer Account Representatives can come from any educational field, the employers expect at least a high school diploma from their candidates for this post. 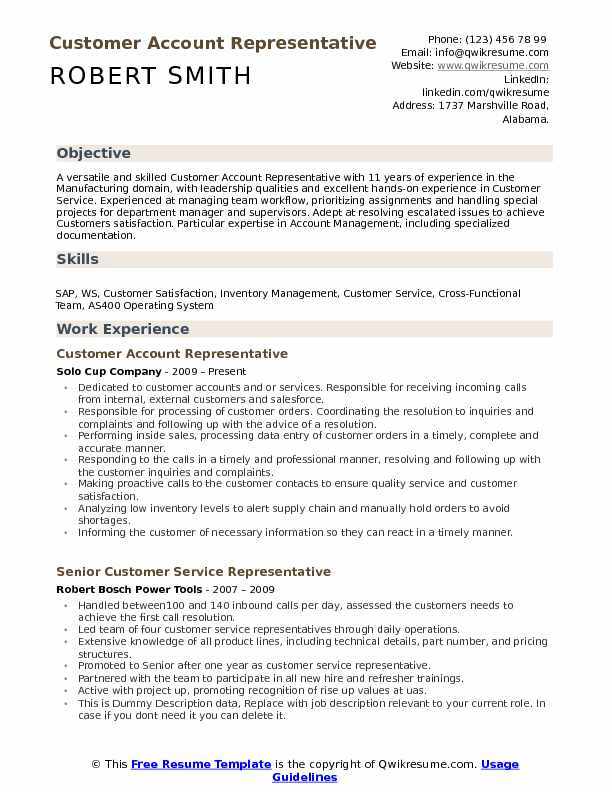 Summary : A versatile and skilled Customer Account Representative with 11 years of experience in the Manufacturing domain, with leadership qualities and excellent hands-on experience in Customer Service. Experienced at managing team workflow, prioritizing assignments and handling special projects for department manager and supervisors. Adept at resolving escalated issues to achieve Customers satisfaction. Particular expertise in Account Management, including specialized documentation. Dedicated to customer accounts and or services. Responsible for receiving incoming calls from internal, external customers and salesforce. Responsible for processing of customer orders. Coordinating the resolution to inquiries and complaints and following up with the advice of a resolution. Performing inside sales, processing data entry of customer orders in a timely, complete and accurate manner. Responding to the calls in a timely and professional manner, resolving and following up with the customer inquiries and complaints. Making proactive calls to the customer contacts to ensure quality service and customer satisfaction. Analyzing low inventory levels to alert supply chain and manually hold orders to avoid shortages. Informing the customer of necessary information so they can react in a timely manner. Responsible for building and maintaining customer the relationships. Including generating, coordinating proper processing, routing, shipment and invoicing of orders within the other departments including but not limited to pricing, credit, transportation and distribution. 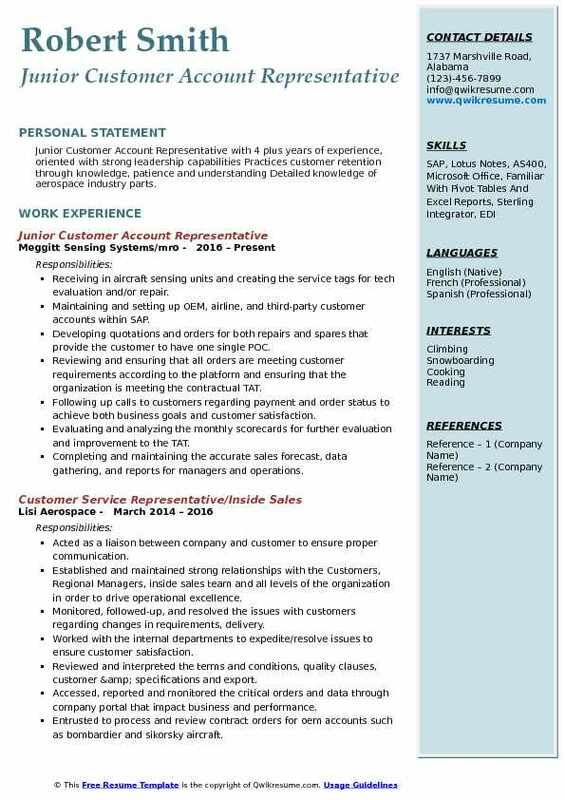 Summary : Qualified Customer Account Representative with eleven years in fast-paced customer service; in person, via phone, and out in the Retail field. Personable and professional under pressure. Verifying each delivery against shipping instructions before delivering to customers. Completing on-time deliveries by choosing the best and most efficient routes. Submitting the receipts and money received from deliveries at the end of each shift. Fostering positive working relationships with customers by responding to their questions and concerns. Receiving and correctly processing the both written and verbal instructions, prints and work orders. Planning and pacing the work efficiently in order to meet daily, weekly, project or production goals. Answering an average of  calls per day by addressing customer inquiries, solving problems and providing new product information. Describing the product to customers and accurately explained details and care of merchandise. Answering the product questions with up-to-date knowledge of sales and store promotions. Summary : Successful and dedicatedCustomer Account Representative with 24 years of experience in the Education domain with proven leadership experience in sales and customer relations management. Strong interpersonal and motivational skills to retain rapport with clients and exceed customer retention rate. Able to identify and solve problems to improve processes and procedures. 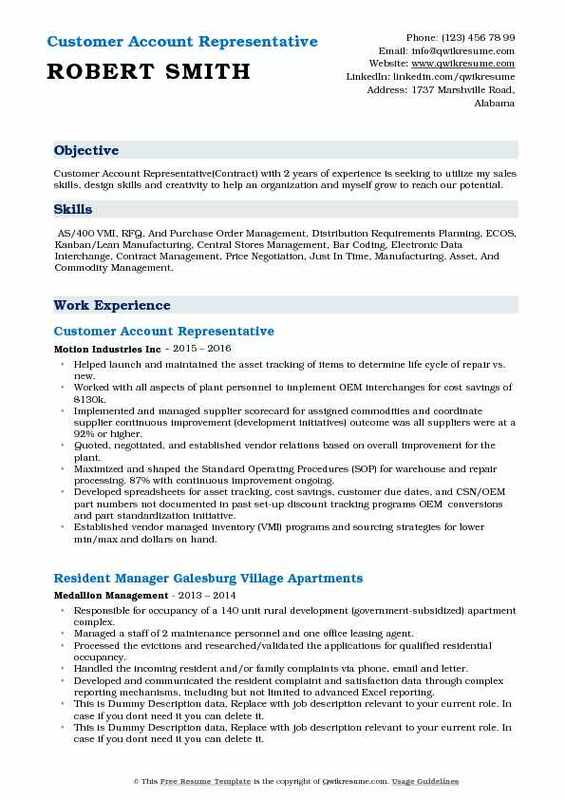 Skills : Customer Centric, Client Management/Development, Customer Service, Project Management, Detailed Reporting/Recording, Training/Mentoring, Policy/account changes, Sales Force, Team Oriented. Proven leadership and customer service responsible to achieve sales goals. Creating and maintaining the quality customer service with new and existing business partners and internal customers. Ensuring that the yearbook program operates with integrity and compliance in all Josten's policies and procedures. Consistently generating the sales through phone and external business sales. Responsible for resolving escalated client inquiries to ensure retention and individual development of associates. Serving as key customer contact for VIP Management of high-revenue yearbook programs. Qualifying the customer's needs, recommending the products and service solutions for new and existing customers. Maintaining and ordering the office supplies as needed for sales team and yearbook advisers. Arranging multiple meetings and events for yearbook advisers and their staffs. Providing exceptional customer service to maintain accounts year over year. Data entry, proofing, and distribution of weekly emails to over 12,000 prospects. Assisting the customers with yearbook creation using online tools and scheduling demos using Cisco Webex. Summary : Customer Account Representative II with 16 plus years of experience in the Retail field is seeking to gain and maintain a position in accordance with my educational and/or work experience that can be used to ensure and enhance the functions of a company's daily operations. Daily scheduling and logistics of deliveries, product returns, and service items. Including the actual confirmation, delivery and set-up, demonstration, and ongoing service of products in the customers home. Contacting delinquent accounts and find solutions to help customers get current and back on a timely payment schedule, first by phone, by daily morning and evening call through, then physical visits to the home. Sales through recognizing potential needs. In-store, and in the field. Soliciting referrals from existing customers, and distributing door hangers to generate potential new leads. Keeping inventory up to date by filing reports, and data input of daily activities into Hytouch software inventory system. Coordinating with the nearby regional stores to obtain out of stock products. Keeping sales floor and showroom clean and stocked with new and used products. Weekly maintenance of delivery vehicle to ensure safety and seamless execution of delivery schedules. Keeping the healthy relationships with customers via superior customer care and service. Recognized for being the most improved store in the district overall, for annual growth in 2015. Individually recognized for top sales in the district in April 2016. 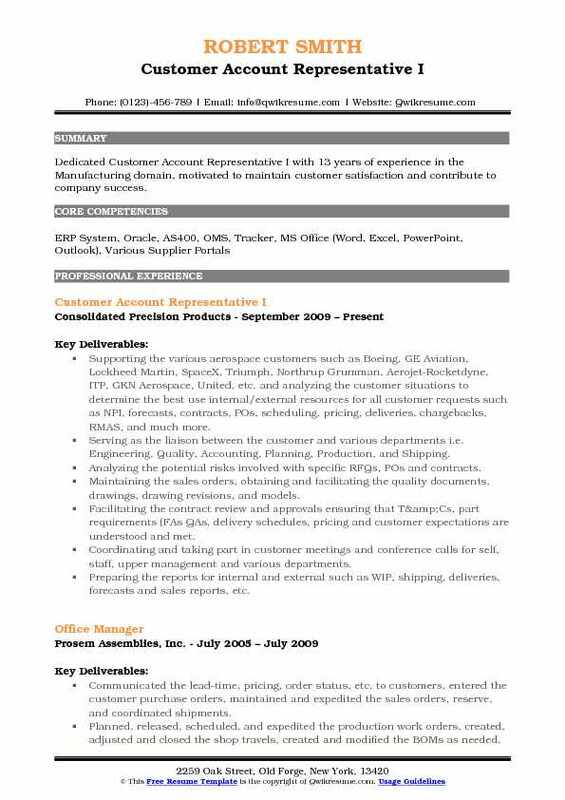 Objective : Junior Customer Account Representative with 4 plus years of experience, oriented with strong leadership capabilities Practices customer retention through knowledge, patience and understanding Detailed knowledge of aerospace industry parts. Receiving in aircraft sensing units and creating the service tags for tech evaluation and/or repair. Maintaining and setting up OEM, airline, and third-party customer accounts within SAP. Developing quotations and orders for both repairs and spares that provide the customer to have one single POC. Reviewing and ensuring that all orders are meeting customer requirements according to the platform and ensuring that the organization is meeting the contractual TAT. Following up calls to customers regarding payment and order status to achieve both business goals and customer satisfaction. Evaluating and analyzing the monthly scorecards for further evaluation and improvement to the TAT. Completing and maintaining the accurate sales forecast, data gathering, and reports for managers and operations. Managing the customer TS and CS through salesforce for quality and contract review. Participating in the DLA meetings for discussion of process improvements and other problem-solving issues. 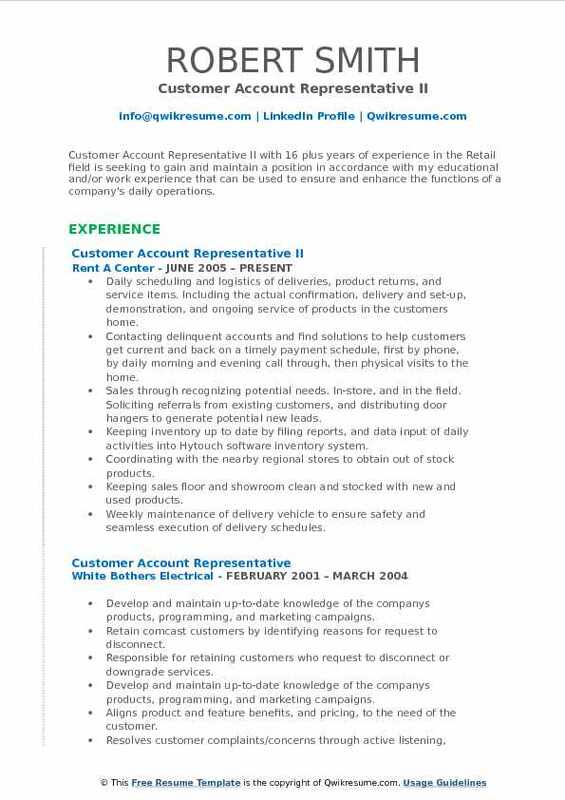 Objective : Customer Account Representative(Contract) with 2 years of experience is seeking to utilize my sales skills, design skills and creativity to help an organization and myself grow to reach our potential. Skills : AS/400 VMI, RFQ, And Purchase Order Management, Distribution Requirements Planning, ECOS, Kanban/Lean Manufacturing, Central Stores Management, Bar Coding, Electronic Data Interchange, Contract Management, Price Negotiation, Just In Time, Manufacturing, Asset, And Commodity Management. Helped launch and maintained the asset tracking of items to determine life cycle of repair vs. new. Worked with all aspects of plant personnel to implement OEM interchanges for cost savings of $130k. Implemented and managed supplier scorecard for assigned commodities and coordinate supplier continuous improvement (development initiatives) outcome was all suppliers were at a 92% or higher. Quoted, negotiated, and established vendor relations based on overall improvement for the plant. Maximized and shaped the Standard Operating Procedures (SOP) for warehouse and repair processing. 87% with continuous improvement ongoing. Developed spreadsheets for asset tracking, cost savings, customer due dates, and CSN/OEM part numbers not documented in past set-up discount tracking programs OEM conversions and part standardization initiative. Established vendor managed inventory (VMI) programs and sourcing strategies for lower min/max and dollars on hand. Worked with the vendors to establish a preventative maintenance plan, lunch and learns for operation personal, and product modification to improve product longevity. 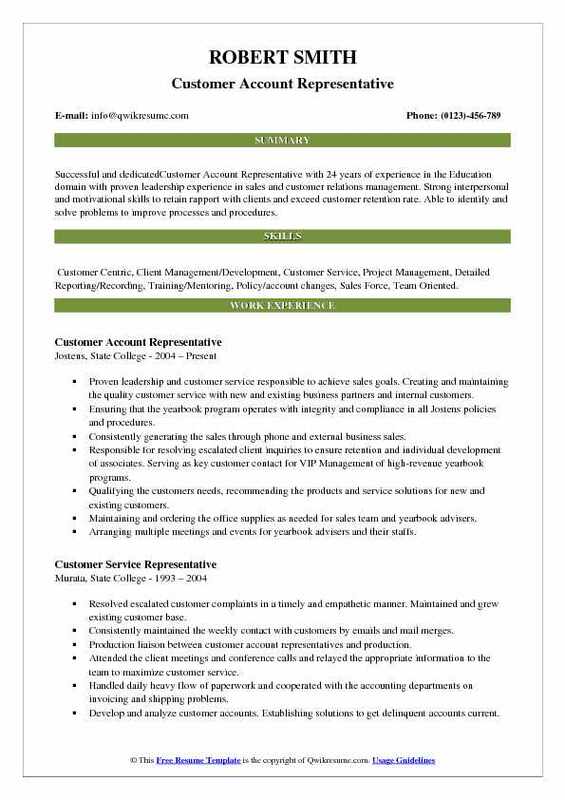 Summary : Dedicated Customer Account Representative III with more than 18 years of providing exceptional customer service through active listening, technical problem solving and extensive product knowledge. 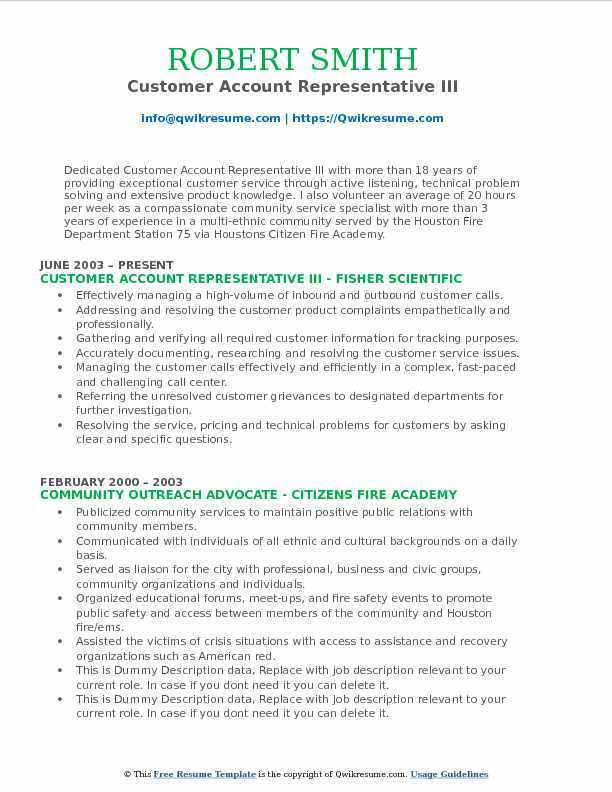 I also volunteer an average of 20 hours per week as a compassionate community service specialist with more than 3 years of experience in a multi-ethnic community served by the Houston Fire Department Station 75 via Houstons Citizen Fire Academy. Effectively managing a high-volume of inbound and outbound customer calls. Addressing and resolving the customer product complaints empathetically and professionally. Managing the customer calls effectively and efficiently in a complex, fast-paced and challenging call center. Referring the unresolved customer grievances to designated departments for further investigation. Resolving the service, pricing and technical problems for customers by asking clear and specific questions. Acting professionally and patiently when addressing negative customer feedback. Routinely answering the customer questions regarding merchandise and pricing. Building long-term customer relationships and advised customers on purchases and promotions. 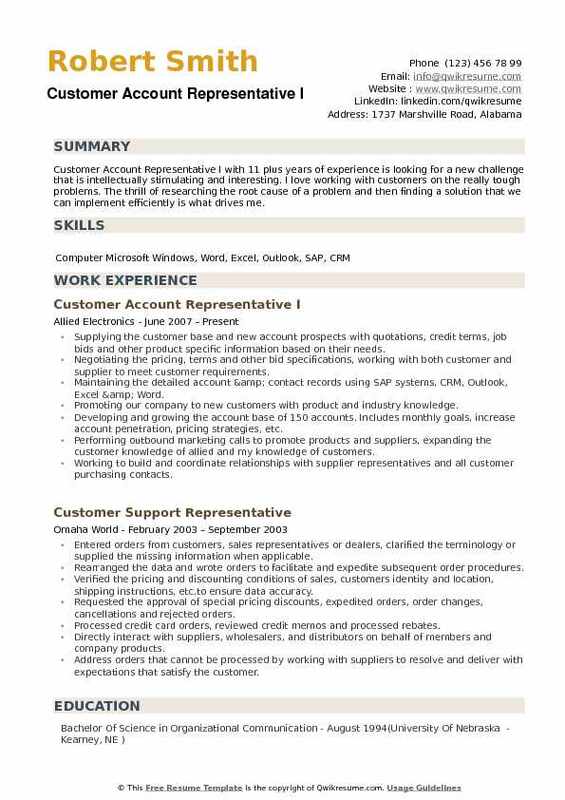 Summary : Dedicated Customer Account Representative I with 13 years of experience in the Manufacturing domain, motivated to maintain customer satisfaction and contribute to company success. Supporting the various aerospace customers such as Boeing, GE Aviation, Lockheed Martin, SpaceX, Triumph, Northrup Grumman, Aerojet-Rocketdyne, ITP, GKN Aerospace, United, etc. and analyzing the customer situations to determine the best use internal/external resources for all customer requests such as NPI, forecasts, contracts, POs, scheduling, pricing, deliveries, chargebacks, RMAS, and much more. Serving as the liaison between the customer and various departments i.e. Engineering, Quality, Accounting, Planning, Production, and Shipping. Analyzing the potential risks involved with specific RFQs, POs and contracts. Maintaining the sales orders, obtaining and facilitating the quality documents, drawings, drawing revisions, and models. Facilitating the contract review and approvals ensuring that T&Cs, part requirements (FAs QAs, delivery schedules, pricing and customer expectations are understood and met. Coordinating and taking part in customer meetings and conference calls for self, staff, upper management and various departments. Preparing the reports for internal and external such as WIP, shipping, deliveries, forecasts and sales reports, etc. Setting up new parts, new accounts, product launch, maintaining the records and related administrative duties. Managing the product POs, schedules, documents, ASNs through supplier sites such as Exostar, P2P, GE Supply Chain, OTMS, and other. Summary : Customer Account Representative with 10 years of experience in the Finance domain is seeking a position in a dynamic company where my extensive years of management experience in the lending industry can help the organization achieve strategic operational objectives. Serving as Customer Account Representative for the financial services department, utility billing division, for the City of Oceanside. Responding to the routine inquiries from the public over the telephone, email or at the counter. Providing general information and assistance to the public regarding billing, collections, and policies and procedures, researching the account billing to resolve complaints. Accurately generating the monthly billing statements for more than 40,000 customers. Collecting the revenue, operating the cash register, posting the information to computerized records, creating new accounts, and terminating the existing accounts. Balance cash drawer, preparing the bank deposits, bag coins, and verifying the accuracy of payments, credits receipts, and other documents. Processing the applications and payments for municipal services, parking permits, business licenses and parking citations. Supervising the staff in the absence of Senior Staff members and Supervisors during the implementation project of the new billing system. Training the new or temporary employees in day to day procedures, policies and city ordinances. Summary : Customer Account Representative I with 11 plus years of experience is looking for a new challenge that is intellectually stimulating and interesting. I love working with customers on the really tough problems. The thrill of researching the root cause of a problem and then finding a solution that we can implement efficiently is what drives me. Supplying the customer base and new account prospects with quotations, credit terms, job bids and other product specific information based on their needs. Negotiating the pricing, terms and other bid specifications, working with both customer and supplier to meet customer requirements. Maintaining the detailed account & contact records using SAP systems, CRM, Outlook, Excel & Word. Promoting our company to new customers with product and industry knowledge. Developing and growing the account base of 150 accounts. Includes monthly goals, increase account penetration, pricing strategies, etc. Performing outbound marketing calls to promote products and suppliers, expanding the customer knowledge of allied and my knowledge of customers. Working to build and coordinate relationships with supplier representatives and all customer purchasing contacts. Sourcing, negotiating price and delivery with over 300 vendors on several different product. Managing the customer order and account requirements, including returns, marketing of new vendor products, sourcing hard to find components and technical product support.